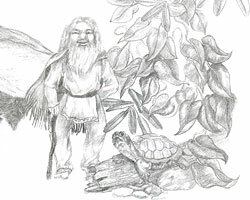 Secrets and Mysteries of the Cherokee Little People is a treasure of traditional Native American stories of elemental beings and angels and their workings with human beings. The Cherokee have spoken of the Little People as long as time remembered. These nature beings are known as the Yuñwt Tsunsdt’. This book reveals some of the secrets told among countless stories by the Eastern Band of the Cherokee Indians. These are a few of their stories. The stories range from delightful tales filled with humor to poignant stories of help and healing. I believe that anyone familiar with the European experience of Little People will find a joyous universality here, as well as confirmation of the goodness of the human heart. Some of the beauty of these stories rings so true that it brings tears to my eyes. In addition to the many beautiful stories recorded here, there is the bonus that this edition features a bilingual interweaving of essential Cherokee words, spelled phonetically for English speaking readers. As you and your children or students read these stories, you will be introduced to and learn a bit of Cherokee and develop a feeling for the language. Gracefully told, wonderfully illustrated, ideal for ages 9 and up. Note that not all the stories are for children, but most are very appropriate.